Dufferin Grove Park is home to a bonfire pit, wood-burning ovens where residents can bake pizza and bread, an adobe courtyard, a weekly farmers’ market, dozens of year-round art festivals, two skating rinks, a cheap and healthy cafe, and regular pay-what-you-can community meals. It’s a chaotic, eclectic, and fairly idyllic public space, but what makes Dufferin Grove Park truly unique is not what they do but how they do it. Members of the community are more-than-usually involved in working to maintain the park, while city staff are more-than-usually integrated into the community. According to community leader Jutta Mason, this simpatico relationship is about to change, and with it all of the features of the park that neighbourhood residents have come to cherish. Mason claims that lower-level employees, too, are regularly accused of having conflicts of interest based on their community involvement. Brenda Patterson, the general manager of Parks, Forestry and Recreation, describes the relationship between the Dufferin Grove Park community and the City as “an incredible and unique long-standing partnership”—one that she says will in no way be affected by Tino DeCastro’s move. “People are concerned that programming at Dufferin Grove Park is going to change, and I’m not sure why. The change in supervisors is in no way intended to change those programs.” Patterson maintains that the moving of supervisors from one portfolio to another is commonplace. Re-assignments are intended to help employees acquire a variety of skills. “When you work for the City of Toronto, you should expect to work anywhere in the City of Toronto,” she says. 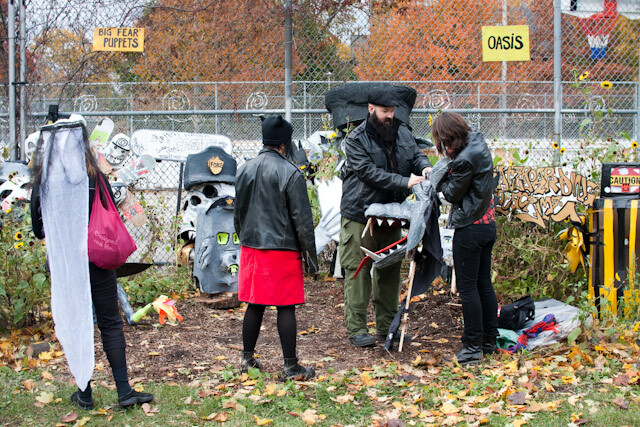 Photos from 2009’s Night of Dread by Nick Kozak/Torontoist.